Long Beach, Calif. – May 13, 2010 – Formula DRIFT continued the new DriftStream with YoParts.com at Round 2: Road to the Championship registering a massive 238,500 unique viewers watching the event live. Formula DRIFT and YoParts.com partner with Justin.tv to distribute the live stream. Over 128 countries tuned in to watch the action at Road Atlanta. 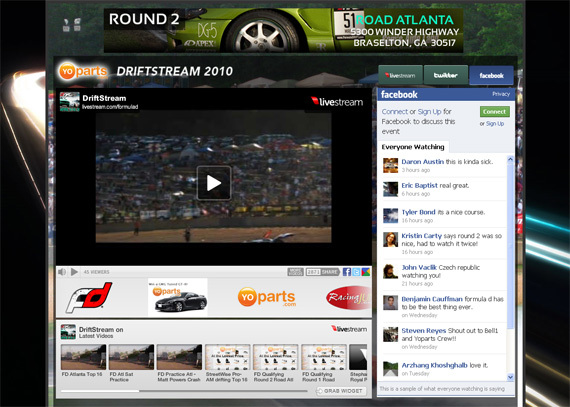 Formula DRIFT and YoParts.com have partnered with Justin.tv, the easiest way to share live video, to help feed the DriftStream across multiple channels. Justin.tv specializes in live streaming and helps engage with the live audience. The Drift Stream will continue at Round 3: The Gauntlet on June 4-5 in Wall, NJ when Formula DRIFT returns to Wall Speedway.